The purpose of this blog series is to consider reasons from Scripture that belief in the doctrine of the Resurrection means a Christian 1. should not share body parts and 2. should be buried, not cremated. Pertaining to the second focus, cremation does not prevent resurrection, but it is not the way the Bible teaches us to handle a dead loved one. For that matter, organ donation does not prevent resurrection, but does God approve of it? There are Scriptural reasons not to sign your driver’s license, if you accept them. Doctors who stand on this rule tell us that transplantation depends on living beings. Vital organs cannot be transplanted from a corpse! The current definition was approved by the American Medical Association in 1980 and by the American Bar Association in 1981. Prior to this, in 1968, a Harvard Medical School committee determined that legal death ought to be defined as: 1. Coma or Unresponsiveness, 2. Absence of Brainstem Reflexes, 3. Absence of Breathing (Apnea). That demeaned the biblical concept. You could say it opened a new front in the culture war. Most who sign their driver’s license have never studied what will occur in the hospital to facilitate transplantation. Perhaps that person has also signed an Advance Directive stating that he does not want to ever be put on a ventilator. But the organ donor will be put on life support because it will be presumed that his desire to donate his organs overrides his desire not to be put on a ventilator. (ref) They may be given anesthesia as well to block any pain, prior to harvesting their organs. Does the sixth commandment apply? You must be alive to donate your organs. Technically it is the medical staff handling the process, but the organ donor has agreed to this arrangement. A Christian must decide whether he agrees with the current scientific definition of death or the old standard. Perhaps this blog post and series seem too strict, even legalistic. There are many things to ponder in this ethical minefield, and no one can answer all the questions. A pastor who is dogmatic about organ transplantation may cause some to depart the Church. For anyone who is offended at this point, remember, people will always disappoint, but Jesus never will. The writer is a layperson trying to evaluate advanced biomedical experimentation and practices in the light of Scripture. Who would want to call for an end to scientific progress in addressing the needs of patients who require new organs? Good techniques and procedures are exciting and laudable. 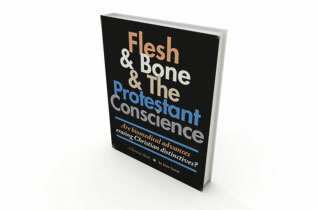 Some examples are noted in the Flesh & Bone & The Protestant Conscience ebook (see links, below right) and in some News Odyssey posts on this blog site. The more we view a body as a commodity or medical treasure, the less we see it as a sacred place where God lives, a temple of the Holy Spirit. Confusion results. Much good may be accomplished as a person’s life nears its end. Can we know what the comatose person may be addressing or concluding? Attending loved ones are given time to reflect and perhaps mend fences, become less impatient, feel repentance, or think about their own life in the light of death. Should we stop this process of character improvement?